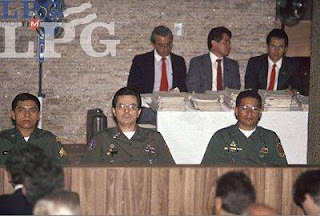 Benavides and a lieutenant, both members of an elite, U.S.-trained battalion, were convicted in the killings but then freed under a 1993 amnesty decree covering crimes during the Central American nation’s civil war. The Supreme Court declared the amnesty unconstitutional in 2016, and Benavides returned to prison despite appeals from his lawyers. Jose Maria Tojeira, a priest who directs the university’s Human Rights Institute, said there several reasons for seeking Benavides’ freedom. Tojeira also said the Jesuits believe Benavides is a “scapegoat” for those who ordered the massacre and were never punished. The Jesuits consider the case against the killers closed but continue to seek clarity on the intellectual authors of the crime. The Jesuits have been consistent in their search for complete justice in El Salvador, and in their position that the conviction of two lower level officers for a crime plotted, ordered, and covered-up at the highest levels of the military command, was not just unless accompanied by prosecution of their superiors.